Summer is a wonderful time for kids, both of my children love to be outside. Going outside and playing at the pool when you have kids is quite different than before you had kids. Please refer below for some tips. When my son was born I was told by my pediatrician not to use sunblock until he was 6 months old. It appears now according to the American Academy of Pediatrics (AAP), that some sunblock can be used for babies less than 6 months old but try to limit the use to "small areas of the body, such as the face and the backs of the hands, if protective clothing and shade are not available." Once the baby is older than 6 months then "[a]pply to all areas of the body, but be careful around the eyes" (AAP). The reason to avoid the use of sunblock for babies less than 6 months old is "[b]ecause of the uncertain absorption of sunscreen through the skin of tiny babies...[u]se it sparingly..." (Sears 735). The best sunblock is to try to keep babies in the shade, use hats, and protective clothing. It was easy for my sun as I loved using the bathing suit tops that had the UV protection. For my baby girl her bathing suit doesn't cover much of her skin so I had to use extra precautions. With my daughter, I was more relaxed and felt a little sun in the late afternoon is not a bad thing, it does provide vitamin D, but I definitely did take precautions to protect her skin. Overall, try to limit sun exposure between 10AM and 4PM when UV rays are the strongest (AAP). Confirm with your child's doctor the best sunblock to use and when it is appropriate to use it. I liked the Earth's Best Mineral-Based Sunblock which was PABA-free. I liked the fact that it was thick and didn't seem to rub off the skin easily. I always like to make sure my kids get a good bath when they get home after wearing sunblock and/or swimming in chlorine. Did you know that swim diapers won't hold in #1 or #2 like regular diapers? Well, I didn't. The first time I put them on my son before going to the pool and then put him in his car seat. When we got to the pool at first I couldn't figure out why he was wet before we went inside and then I realized he must have gone to the bathroom. I'd recommend putting on the swim diapers once you get to the pool not before like I originally did. Huggies and Pampers have a swim diaper line. The main point of swim diapers are that they don't swell up in the water like regular diapers. Most pools usually require you to have your baby wear swim diapers or the plastic pants over a diaper. I found it hard to find swim diapers for infants. When my baby was too little for swim diapers I would use a regular diaper with the Gerber Waterproof pants which have a nylon covered elastic leg and are available in sizes 0 -3 months to 3T. If you can encourage your child to wear a life jacket, swimmies, or any floatation device it may make it easier and give you some comfort. Unfortunately my son wouldn't wear any of the above. Be careful though even if the child will wear a life jacket with the little kids if they are in the baby pool they still may end up face down in the water and it may not help much. The most important thing is to never take your eyes off your kid as in a split second he could be under the water before you know it. Even once my son was a stable walker and was able to maneuver in the baby pool I had to watch for older kids that accidentally knock him over or other little kids that could pull him over. There are a lot of nice baby rafts to use with parental supervision. My 3 year old son has fun playing with his kickboard in the water. If you are at the pool with more than one child, then please refer below for some more tips. Taking one child to the pool is a lot of work and taking two can be even more challenging. It obviously depends on the age of your kids but when they are young it is definitely extremely important to keep a close eye which can be challenging when you have kids going in different directions. If your child is old enough to wear a life jacket and it properly keeps him afloat that would be an easy approach. Or you may have to have the kids take turns if they are young enough; i.e. entertain one in the stroller with snacks/ toys while you can keep a watchful eye on the other child. I had a baby raft that my baby could sit easily in herself that I could sit next to me in the zero entry section so I could watch her brother playing. 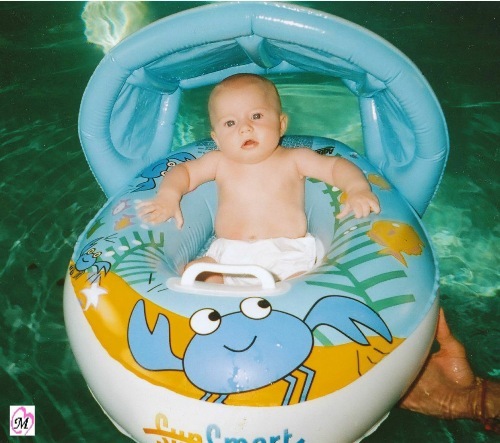 Here is a picture of the raft used by my son when he was little. If you can afford it, some people get a "mommy helper" like an older child that you pay to help assist you watching the kids. As you may be aware once you have kids it is rare you go anywhere without taking snacks. I always try to take at least a bottle of water and a piece of fruit (apple/ banana) for my toddler. If you have a smaller baby you may want to take a bottle, baby food, or at least baby snacks. I try to plan to be there longer than I expect. Also, it is great if you can take stuff and have your child eat lunch or dinner at the pool and then you don't have to worry about making a mess at home. For us, that never seemed to work, even if we did eat at the pool my son usually ate again at home but it was fun snacking at the pool anyway. If you plan to breastfeed, check out the MOMMBY Peek-a-Bye-BabyTM cover which works great to provide protection for Mommy while not covering your baby's head so she doesn't become as overheated in the hot sun. If you are like me you will want to capture the first swim with your camera. So try not to forget the camera or video camera. Or you may want to take a water safe camera so you don't ruin your good camera. You may also want to take a few toys to the pool. You may wonder, why would I take toys to the pool, isn't the pool enough? That is what I thought but I found at my local pool a lot of kids brought things and if I didn't take anything then I had a toddler crying because he wanted to play with the other kids toys so it was just easier to take a few for him so he wasn't stealing toys from other kids. You then have the opposite problem of other kids trying to use the toys but that just gives the perfect opportunity to start teaching about sharing. Some of my favorite toys to take are a bucket and shovel or cup to fill the bucket up; balls to throw, or any other little toys to throw in the baby pool to find and put in the bucket. The toys that squirt can be fun as well. I usually take a few extra swim diapers, regular diapers, and a dry change of clothes. You may want to take baby soap if you plan to shower there. I'm usually close enough that I just put a dry diaper on, change of clothes, and then shower when we get home. I like to make sure everyone washes really well after wearing sunblock and being in the chlorine. At our old neighborhood I was able to walk to the pool and I loved walking there while my son sat in our red wagon. It was a bit of a hike but I enjoyed the walk. At our new community, it is a little further and since I now have two kids, it is easier to drive. I may still take the wagon simply to help get all of our pool gear into the pool. I've always loved the pool and I was so excited to take my 1 year old to the pool. I planned to go everyday. Then when the time came, I realized it was a lot of work getting ready and trying to organize going around his nap schedule, getting him dressed, putting on the sunblock, hat, packing snacks, toys, towel...but I thought it would be well worth it once we got there. Then I found out that my 1 year old who was still excited about his new walking skills wanting nothing to do with the pool, he just wanted to walk around the pool. So after a few days of the effort of getting ready for the pool I realized, it just wasn't worth it to have my son walk around a pool and chance having him fall in; I'd just as well let him walk around our kitchen table at home. Now, my 3 year old truly does love going to the pool and seeing his friends, especially friends from preschool, and my 7 month old loves to sit and splash in the water. It still can be a lot of work getting everyone ready to go but it is definitely well worth it. The key is to set your expectations that taking kids to the pool although it can be a very enjoyable experience is not the same experience you may remember before you had kids. American Academy of Pediatrics (AAP). Sun Safety: What's the best way to protect my child in the sun?" healthychildren. 1 June 2011 <http://www.healthychildren.org>. Everything You Need to Know About Your Baby - From Birth to Age Two. New York: Little, 2003.